One of the questions that gets asked a lot in our Facebook community group is how to meal prep using frozen meat. Many people like to stock up on meat when it goes on sale and package it into smaller portions. This is one thing I have done for years to help save money. Normally when meal prepping 5 dinners for the week, the rule of thumb is to check the sell by dates on your meat (try to buy the ones that are furthest out) and write those dates on your bags. The sell by date does not necessarily mean that the meat needs to be cooked by exactly then, but it should be used within a few days of that date. With previously frozen meat, however, it is a different story. The USDA recommends that after thawing meat such as seafood, poultry, and ground beef, it should be cooked within 1 to 2 days. Red meats can remain in the fridge for 3 to 5 days. There is a great article on the USDA’s website about how to safely thaw meat and guidelines for refrigerator time afterwards here. So, now that you know how long to keep thawed meat in your refrigerator, let’s address what to do about meal prepping. You have a few different options, depending on when you will be cooking the frozen meat. If you know you will be cooking the thawed meat later on in the week, go ahead and prep everything in a bag, but leave out the meat. The night before you are going to cook that meal, put the frozen meat in the refrigerator to thaw out. Once it is thawed, go ahead and add it to the bag. Letting it thaw outside of the bag will cut down on the amount of extra liquid from the thawing process. 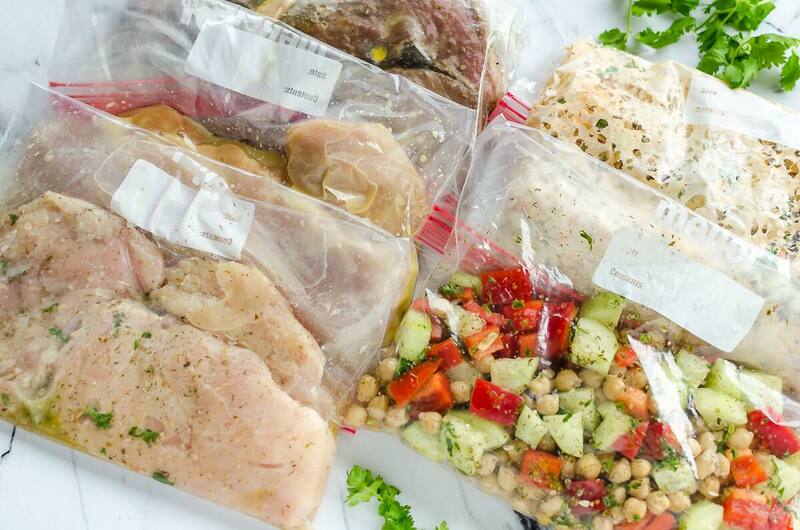 For meals that have more of a marinade, it would be beneficial to put the thawed meat in the bag the night before, to give time for those flavors to really infuse. Assuming you plan on cooking your thawed meat on day 1 or day 2, go ahead and thaw the meat and prep as you normally would. Although I like to stock up on meat for my freezer, I don’t often prep more than about 2 meals with that meat, so I plan to just have those on the first and second day after I prep. This is the least desirable option, but if you plan on freezing a couple of meals anyway, this is the way to go. The reason I like this option least is because almost all meat lets off liquid when it thaws, so if it thaws in the bag with all the other ingredients, it is going to water down your meal. Meals prepped with frozen chicken will tend to have even more extra liquid, since chicken is often pumped with water. If you decide to go this route, once everything is all thawed, drain the excess liquid out of the bag. I like to cut one of the bottom corners off of the bag and drain it in the sink. Once the thawed meal is in a pan, go ahead and add a little extra seasoning to it. The seasoning can tend to get lost with all that extra liquid, so this step will help make sure your meal is full of flavor (check out the post about seasoning food here). Now with these tips on frozen meat, grab a 5 Dinners 1 Hour menu and go prep your dinners for the week!